Last week the Policy Exchange, a right-leaning think tank, published a report called A Right to Build. The subtitle, Local Homes for Local People, seems to have been lifted straight from the League of Gentlemen, and if the comic reference was unintentional, it is matched by a script that looks like it was written by David Brent after a session down the pub. The problem is that when you put Tories in front of this notorious bar chart, (NB it that shows that we in the UK don’t really get selfbuild), they immediately jump to the wrong conclusions. Now Alex Morton, author of this report, jumps to a very different conclusion to the ones I have heard voiced so far, but it’s still way off the mark. Morton’s big idea is that local authorities that fail to hit their own housing targets should be required to release land for self-build housing to local people. This would encourage speed and realism; realistic targets, based on politically acceptable self-build homes. The CLA process involves the council stating that they want land for a set level of homes to be put forward for development. Landowners can come forward offering their land at a specific price in a ‘sealed bid’ auction. No one would know what others were offering. The lowest priced land is granted permission, and then the next lowest priced land, and then the next lowest, and so on, until enough land is released for development to hit the target. So where exactly would the cheapest land be located? You guessed it. In the worst location. Probably next to a motorway or under a flight path, probably three miles from the nearest shop where there are no roads, no infrastructure, no schools and nothing for company except the adjacent parcel of crap land where the second cheapest plot would be. This really is not much better than gulag development, out of sight and out of mind. OK , you might argue that this is like a re-casting of the 30s plotlands developments where people from the big cities were offered small-holding-sized plots for next-to-nothing in the middle of nowhere, but the idea back then was that the pioneer plotlanders would be able to make a living from horticulture or market gardening on the land. I don’t think this is what the Policy Exchange is on about. Then there’s the local bit which they hope will defuse the NIMBY factor, by taking the overt speculation out of the equation. Instead of having land divided up in private deals between councils, landowners and developers (what happens now), the Policy Exchange hopes that there will be a lengthy queue of prospective selfbuilders forming a waiting list for the newly released land, merrily waiving their rates bills to prove local residence qualifications and their chequebooks to pay the Community Infrastructure Levy. This seems to be based on the compelling statistic that 400,000 people search Rightmove for building plots every month. Well, I’m one of them, but I don’t want to live on a squatter camp sandwiched between the M11 and the Stansted runway. And just how many of this 400,000 are in a position to raise finance and take on a major building project? I suspect very few. On the national stage, this policy will help the push for more homes. Those opposing all development will be unable to hide behind nonsense about opposing greedy developers. Opposing these reforms would clearly mean denying an ordinary family the home they need. Supporting these reforms will show that politicians are in favour of ‘the little guy’ and squeezed ordinary working people trying to get on in life – exactly the group which all parties say that they are keen to support. What do they smoke down at the Policy Exchange? With friends like this, the selfbuild movement better watch out because the goodwill that currently exists towards selfbuild will evaporate very quickly. We will be about as popular with the local Tories as the gypsies down at Dale Farm. Result? 100,000 new selfbuild homes ready for occupation sometime next year. I suspect Morton spent too many of his teenage years playing at being mayor of Sim City, because if he thinks that timeline is realistic, he cannot have first emerged from his bedroom more than three weeks ago. 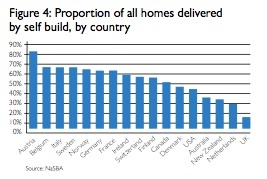 Ok,I know that the Germans build this number of selfbuild homes every year, but they have been building up to this level for decades. They have an industry in place to service this amount of custom building. Plus they practice something very similar to compulsory land purchases, with the local councils deciding where these new homes should be located. Being a right-leaning think tank, the Policy Exchange can’t bring itself to mention a phrase like Compulsory Purchase (unless of course they are promoting high speed rail links, but that’s another story), so they come up with the ludicrous concept of the Community Land Auction instead. If we want to copy the Continental housebuilding models (and I think we should), can we at least pay them the respect of understanding how they work, and not try to promote such hare-brained, ill-thought-out solutions. The future for selfbuild in the UK still looks rosy, but it's never going to be an overnight panacea for the unpopular housing market we have created and it's ludicrous and potentially damaging to pretend it could be.